Shareholders will vote on banks picking up a majority stake – at a price of Rs 1 for 114 million shares, to avoid putting India’s oldest private airline into court-administered bankruptcy. For Jet Airways India Ltd., it’s always only about one rupee. As I wrote last month, the troubled full-service carrier needed to garner an additional Rs 1 (1.4 cents) per available seat kilometer to make up for its cost disadvantage against no-frills rivals. Cutthroat price competition denied it that opportunity, and now banks are picking up a majority stake – at a price of Rs 1 for 114 million shares. 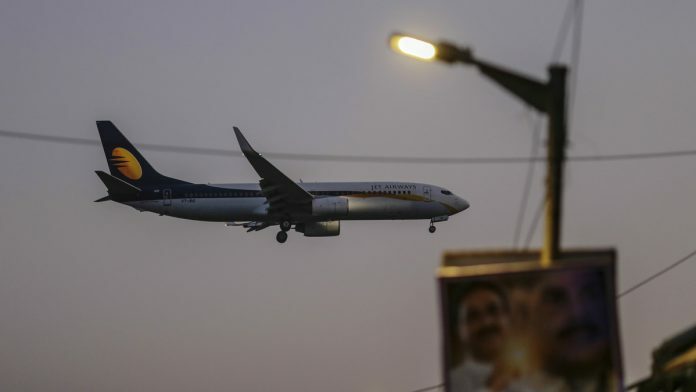 The gamble, which seeks to avoid putting India’s oldest private airline into court-administered bankruptcy, will be put to a shareholder vote on 21 February. Beyond that, the details of the rescue plan are fuzzy. How will new funds enter the business? Founder Naresh Goyal and Abu Dhabi’s Etihad Airways PJSC are expected to bring in equity. But Etihad, which is expected to lead the round, doesn’t want to trigger India’s takeover code, which will then force it to buy shares from minority investors. The solution, according to Livemint, may be a 40 billion rupee rights issue to which lenders (as new equity owners), as well as Etihad and Goyal will subscribe. 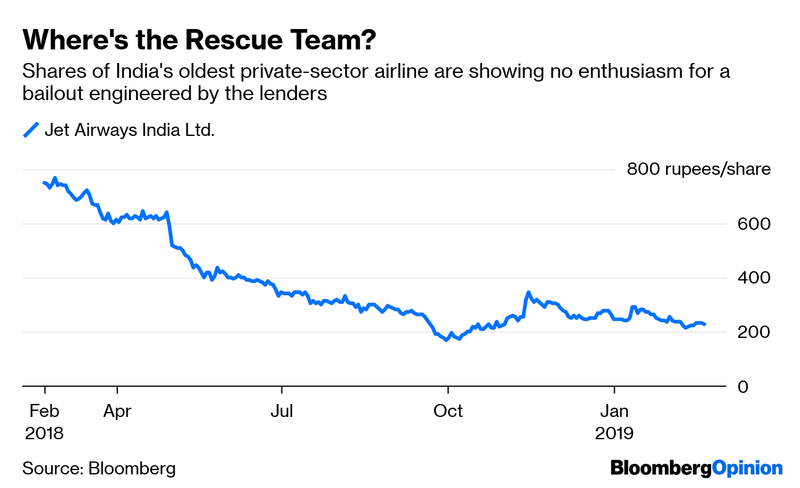 Banks will get into trouble if the rescue eventually fails, like it did in the case of a 2011 debt-to-equity swap at the now-defunct Kingfisher Airlines. So they will probably want to share the risk with a new investor. The name of India’s state-owned National Infrastructure Investment Fund, or NIIF, is doing the rounds. The final picture is still muddy, but the consensus seems to favor 50 per cent-plus ownership by banks and the NIIF; a 22 per cent to 25 per cent stake with Goyal, who currently controls 51 per cent; 12 per cent with Etihad, diluting the Middle East carrier by half; and the remaining shares with the public. That’s how Rs 57 billion out of Jet’s estimated 85 billion rupee funding deficit can be plugged. As for the remaining 28 billion, this gap will close only if lenders agree to convert a part of their loans into a quasi-equity-type instrument. BloombergQuint says cumulative redeemable preference shares, carrying a 0.01 per cent coupon, may be part of the toolkit. On paper, the plan looks like it may work. Yet Jet shares, which have dropped 70 per cent over the past year, haven’t reacted. After all, minority shareholders will also get diluted together with Etihad and Goyal. The founder might lose his board seat. Who’ll be in the cockpit instead of him? State-owned banks (plus NIIF) will have control, but they don’t know how to run an airline. Besides, even as Jet turns into a semi-state-owned carrier, taxpayers already have another mouth to feed. The government tried to sell 76 per cent of Air India Ltd., together with $5 billion in debt; there were no takers for the unprofitable flag carrier. Between them, InterGlobe Aviation Ltd.’s IndiGo, Jet Airways and SpiceJet Ltd., the three publicly traded Indian airlines, lost Rs 200 million per day between April and September because of high oil prices and a weak rupee, according to ICRA, the local affiliate of Moody’s Investors Service. And yet the world’s fastest-growing aviation market is gripped by a mad expansion it can’t stop. IndiGo, the biggest of the three, will increase its passenger carrying capacity by 34 per cent between January and March despite a crippling pilot shortage and a 75 per cent profit slump in the previous three months. SpiceJet, which had a passenger load factor of 90.9 per cent in January, announced 12 new domestic flights on Tuesday. 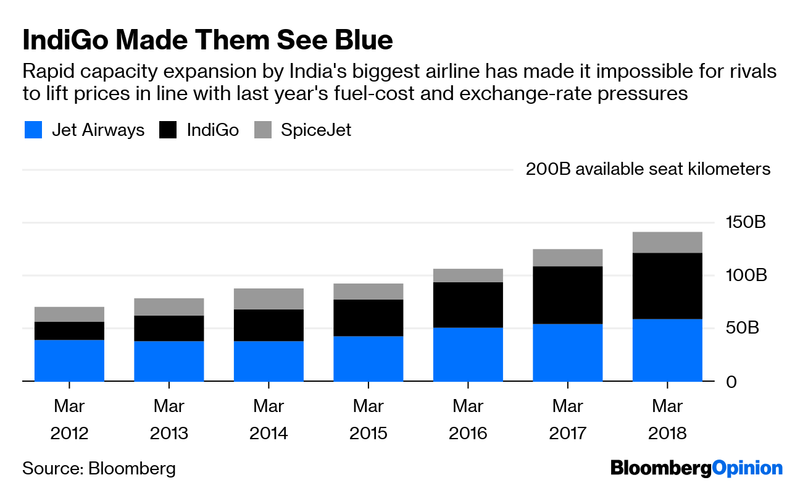 With 90 more aircraft to be added to the Indian fleet over the 12 months starting in April, cheap tickets will continue to dog profitability.